Wine bottles should stand tall and proud, but I’m happiest when my rum bottles sit short and squat. It just seems right that a rum stay true to its maritime heritage by maintaining a low center of gravity and wide footprint so to better brave the rolling seas. Or if ashore, to better survive the accidental bumpings that so often occur in the immediate viscinity of delicious high proof spirits. 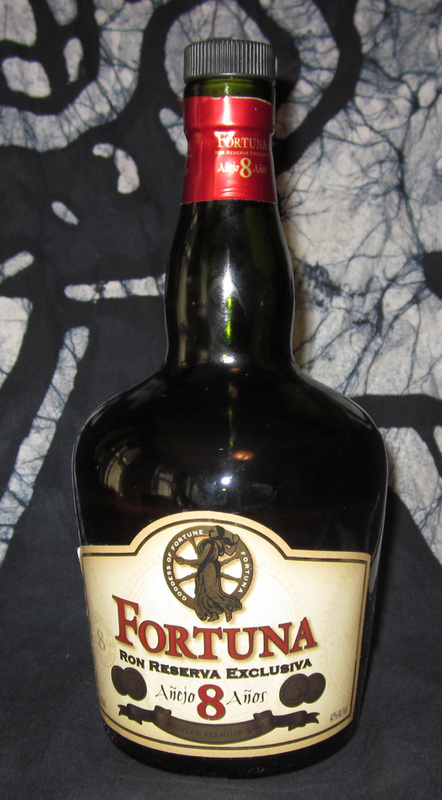 Fortuna, Ron Reserva Exclusiva is an eight year aged rum in a classy, lovely squat bottle. The green glass disguises the hue of the rum within, but this is soon remedied by breaking the foil and removing the cork. Upon doing so, the nose is immediately met with a combined sweetness and muskiness – caramel intermingled with subtle vegetation. In the glass, this rum is a light amber much akin to honey in color. Fortuna is remarkably bold right from the first sip. Its musky-sweet scent carries forth into the taste, but so does an unexpected spiciness. Think peppered, candied bananas and you’re on the right track. Even the tiniest sip invigorates, tingling the tongue and throat, fading for a bit, and then followed by a gently growing finish. This is definitely not a rum to be rushed, as every taste is an experience in itself. Take your time with this one. Enjoy it at a relaxed pace in a comfortable environment where you can give it your due attention and it won’t dissappoint. This entry was posted in Rum and tagged amber rum, fortuna by Bilgemunky. Bookmark the permalink. Bilge, thanks for the review; sadly Fortuna (amazingly) is not available in S. Florida. The current trends seem to indicate a reduction in selection. As far as squat bottles go I’m there with you. Perhaps our greatest disappointment was when Mount Gay tossed out 300 years of provenance and canned their lovely, semi-squat classic bottle (that had changed little) for the new heavy modern bottles designed to justify price increases. Oddly enough this didn’t work – MGXO was raised from $29 to $50, but then had to return to just over $30, where it remains today. Bilgey, thank you for the review. Yes, I like the bottle, too. But, I must say that Capn Jimbo has been going on. and on, and on, and on, about that bottle for 5 years now. CJ really needs a life beyond rum and kayaks, BTW. It’s really, is not about the bottle, “Is it?!!!”. I found this rum after a, well, quest, and a I agree with the 4 star rating. It is a nice rum, kinda like Puerto Rico’s Ron de Barrilito in the spicy dept.. That said, it’s some sort of manufactured product. I guess blended from Flor de Cana… Who knows. BUT, pretty good! I discovered Fortuna a few months ago at Grand Liquors in Astoria, Queens, NYC. I bought it without tasting upon the recommendation of one of the managers for just $20 Bucks! What a find for that price! Incredibly smooth though a little spicy with a long lingering finish on the palate. Would be a strong consideration at almost double, if El Dorado 12 or 15, or Vizcaya Cask 21 is not available. The Fortuna 8 finally arrived at our local Total Wine & Spirits, along with a nice Ron Medellin 8 (which we plan to review as a Poker Run Pair ‘o Eights. I can now agree with your review of the Fortuna 8 – you nailed it. Very pleasant, lots of sweet heat, deep banana and a bit of a dangerous rum. Put this together with a nice dark Sancho Panza for the evening, and don’t plan to drive.